So really, what’s an online diary without the daily grind, including pictures of me doing totally normal things? Well, I’ll excuse this post because it’s really a contest entry and a good deed at the same time. And I got free cookies. 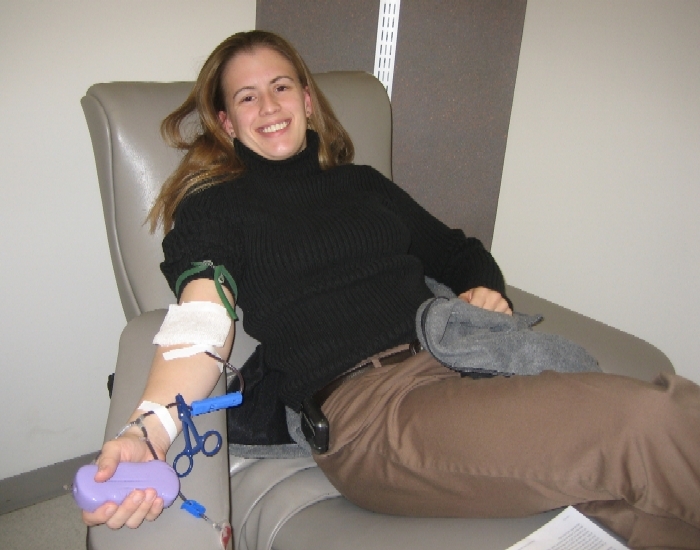 I saw on PastaQueen’s blog that Manic Mommy is trying to get people to give blood, and there’s a prize up for grabs. Well hey, I used to give blood all the time when they did drives at work, Nicole and Aaron and I tromping down to the bus to get stabbed, but there haven’t been any blood drives lately. Just the other day I thought I ought to get to one of the brick-n-mortar donation places, and then I saw the blog post and decided today would be the day. So after work I drove downtown and rolled ’em up. I nearly flunked the iron test (centrifuge pardoned me; guess I better start taking those multivitamins again), and there was a backroom consultation about whether my recent tetanus/pertussis/diphtheria vaccination made me ineligible (did you know you’re supposed to get those again as an adult? ), but I was given cookies to kill the time even before the donation! Then I donated without incident, except that Tajuana’s technique didn’t measure up to most of my bloodletting experiences. It STUNG! And again when she took it out! But I did bleed faster than usual (sometimes I dry up and get kicked out), and then there were more cookies, so here’s to being an introvert and giving blood on your own when your best friend gets promoted to work for a big shot at the marbled halls of the corporate headquarters and ditches you you have a few minutes after work! I looked much more Sprockets when I had the gray jacket on over the black ribbed turtleneck! This entry was posted in Completely random, General, Social commentary/rants by Amy. Bookmark the permalink. 15 August 2008 also marks my freedom to have a cigar and bourbon whenever I want. So, we’ll give blood, then I’ll stuff myself with bad things. Sound like a plan? I applaud you. My mother was a phleobotomist for a while and kept some of the rubber bands and vials on her dresser (God knows why) and used to taunt my “niccce veins.” Therefore, I have a phobia about blood drawings and have never donated. Shame on me. And yet, this morning, I had a Dr. appt where a test was required and the nitwit nurse couldn’t get a vein to open for her and I nearly passed out after two pricks. So, it’s in my head, and yet, I still cannot do it. So I think it’s cool you and can and do. I love the title of this post!! Thanks for donating!! I can’t wait until the drawing someone is going to be a happy camper!! Pingback: Amy’s Gripping Commentary » I won! Pingback: Amy’s Gripping Commentary » Go, Speed Bleeder, Go!